Exascale Review 2019: Is Exascale a Good Hosting? 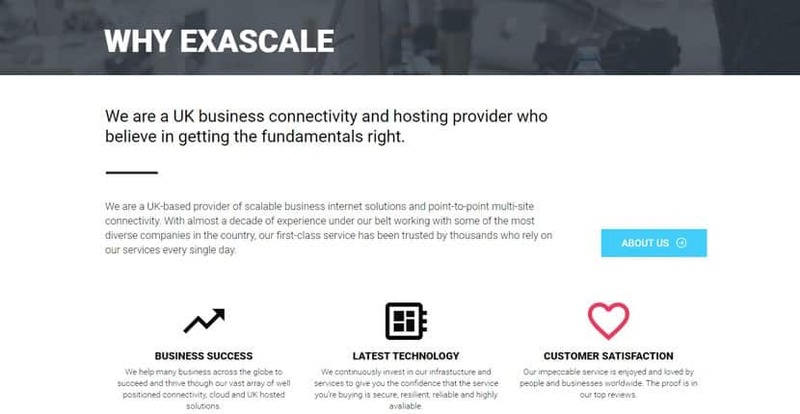 Exascale offers enterprise-level hosting to businesses that prefer a highly personal hosting provider with excellent customer service. They are a U.K. business with three Tier IV data centers in the country. 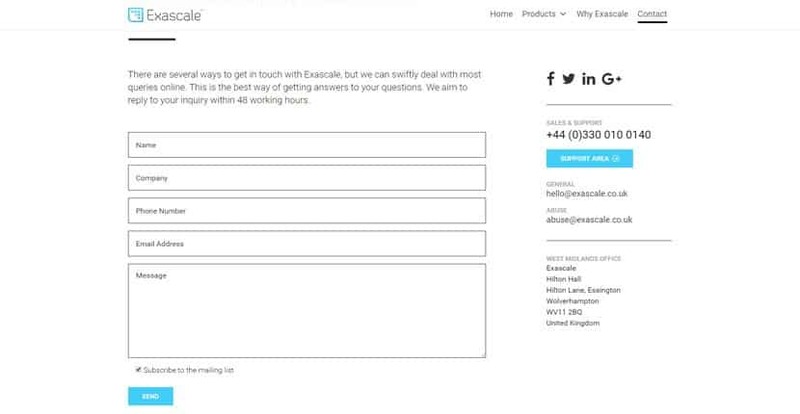 Exascale offers enterprise-level hosting to businesses that prefer a highly personal hosting provider with excellent customer service. Originally founded in 2009, they’re a U.K. business with three U.K-based Tier IV data centers. Their website and support are available in English. Exascale’s infrastructure is excellent. They own and operate multiple Tier IV data centers in London, Manchester, and Cheltenham. These centers are equipped with 24/7/365 onsite security and monitoring, gas turbines and diesel backup power generators, and high speed 10Gbps Ethernet Tier 1 global transits. What’s even better is that they commit to a zero downtime Service Level Agreement. They offer four packages of dedicated servers named Value (8GB RAM and two 1TB SATA III drives), Essential (16GB RAM and two 1TB SATA III drives), Advanced (32GB RAM and four 1TB SATA III drives), and Professional (64GB RAM and eight 1TB SATA III drives). All of these plans come with either software or hardware RAID, unlimited transfer, a default IPv4, and an IPv6 /64 subnet. These dedicated servers also afford users with a lot of control and customizability. You’ll have APC reboots, KVMoIP access, and full root access, as well as your choice of Plesk or cPanel for the control panel. It’s important to note that these are unmanaged dedicated servers; while Exascale supports the underlying hardware, it’s the customer’s responsibility to manage the operating systems and any applications. You do have the option to purchase management services for an extra monthly fee, though. Finally, another thing I appreciate about Exascale is their flexibility. Though they do have base configurations, you can customize the servers in many ways during the checkout process. Options include but are not limited to: database types, control panel types, number of IPs, server location, and backup frequency. These dedicated server configurations can also be upgraded at any time. Exascale’s prices are about average; they’re neither super cheap nor crazily expensive. Throw in the fact they own and operate their own Tier IV centers and I’d say their packages are well worth the price you’re paying. Domain registration is, of course, an additional fee, though strangely enough SSL certificates are free (with the exception of their 12-month certificate). You’ll also have to factor in 20% VAT as an extra cost. Unlike many other enterprise-level hosting companies, you can buy and pay for your plan 100% online, which is nice bonus. Their plans are only available in monthly billing terms; however, this does mean you cancel or upgrade at anytime. They don’t appear to offer a money back guarantee, but they do have a customer satisfaction promise. Support is available 24/7 and you can contact them by email or phone. I was surprised to see that considering their “customer satisfaction promise,” they only guarantee an email response time of under 48 hours — this seems more than a little slow especially considering their target customer base. That said, I’ve always been able to reach them quickly over the phone, so that’s a viable option if you require more immediate assistance. If you’re looking for professional hosting with high availability, this is a great choice. Bear in mind that they don’t have any solutions for individuals looking for just a basic website, however, beginners will have to look elsewhere. Wondering how Exascale stacks up against other Web Hosting companies? Enter any other Web Hosting company and we will give you a side-by-side comparison.